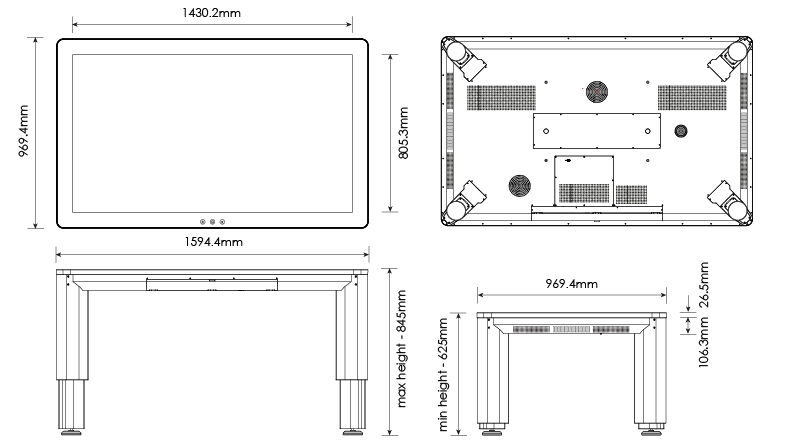 Electric height adjustable collaborative table with easy access from all sides. The Promultis Tetra Touch Table Elite is a sturdy, collaborative, interactive multitouch surface solution that integrates the latest touch screen technology into a user-friendly and intuitive design. Incorporating capacitive touch technology with a unique ‘micro air gap’ feature for a table top with a completely flat surface. The 65inch, 4K UHD screen offers up to 50 touch points. Complete with Android Operating System, the system is completely plug and play with no drivers necessary for interaction. By touching the home button on the front of the screen, you can directly access the Android home page for complete ease of use. This versatile table can be used as a low-style table as well as a higher one resulting in superb, all round accessibility for children and adult users alike. The table has electric height adjustment, allowing it to be lifted, or lowered, effortlessly at the touch of a button on the front of the table top. The Tetra Touch Table Elite also has incredible connectivity by means of integrated Wi-Fi, HDMI, RS232 and USB ports, making the connection of other devices seamless and easy. Access to the connections is via a drop down panel on the side of the table. The table includes internal speakers. The Tetra also provides a large working surface area allowing several users to collaborate all at the same time. Users can control the content they see by using natural gestures such as pinch, zoom and drag, much like the majority of today’s smart phones, this makes for an incredibly intuitive and familiar way of manipulating content for all ages. If you do not have content ready for your new Promultis Tetra, we are capable of producing fully featured bespoke software solutions in-line with your brand and/or campaign, you can also opt for Snowflake MultiTeach Suite, perfect for education / training installations. integrates the latest touch screen technology into a table. The Promultis Uno Table delivers the ultimate collaborative surface allowing seamless access to every side of the touch surface at standing height. The ProMultis Vari Tilt is a mobile, height and tilt adjustable multitouch solution giving you the greatest flexibility. Built within a strong, robust aluminium frame for heavy use, it can be knocked, moved from room to room. 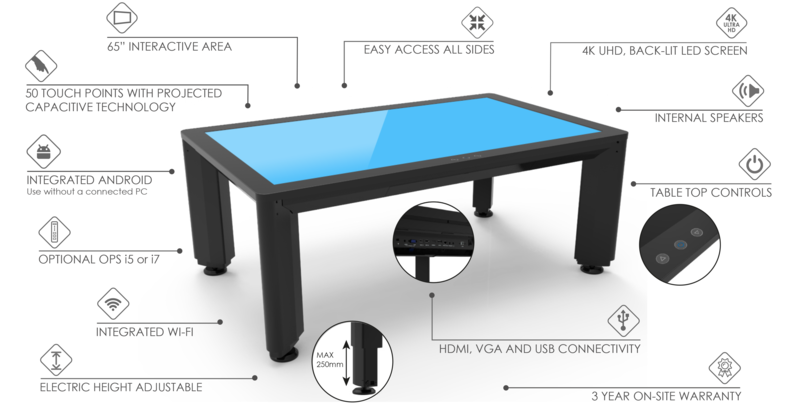 Large electric height adjustable collaborative, multi touch table with easy access from all sides.